Outside of college, one way that a fortunate few were able to see classic films was through participation in film clubs. A group of people would get together for regular 16mm screenings of classic films, often with a guest present who had some level of involvement with the movie and who would participate in a "Q and A" session following the show. As you might expect, these weren't exactly Joe Lunchbucket affairs; not just anyone could get hold of a 16mm print to show in their rec room (not to mention book a director, producer or star to appear for the discussion session). On a Saturday night in 1964, cinephile Bob Forbes gathered about 40 friends to see KING KONG with Merian C. Cooper himself as special guest. Patron saint of all collectors Bob Burns (also current owner of the only surviving Kong armature) was present for the event and later given a copy of a recording of the evening's discussion with Mr. Cooper. 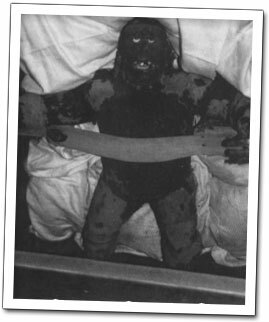 Tom Weaver transcribed the tape recently for an article in Monsters From The Vault magazine (Volume 9, Number 18) [http://www.monstersfromthevault.com/], and the piece is accompanied by a rather well-traveled photo of Cooper, pipe in hand, smiling as he regards a boxed miniature ape (which can also be seen on page 133 of the book I wrote with Bob Burns, It Came From Bob's Basement). Cooper: ... Also the writer (small laugh). Forbes: And the writer. The creator, the man who made... Well, it's your picture all the way through. But I thought it would be very interesting if we had its star with us. Incredulous Woman in Audience: Fay Wray?!?! Same Incredulous Woman in Audience: No! Forbes (indicating a small wooden box marked "Kong"): So I went over to RKO, or Desilu, and I have here its star. 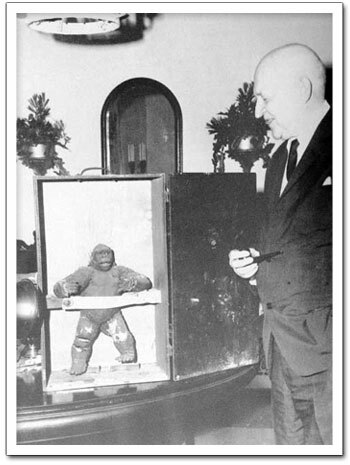 Another undated photo of the same Mighty Joe Young puppet, with added padding in the case, a bit more wear than we see in the Merian C. Cooper picture, and a mournful upward stare. And there he is. 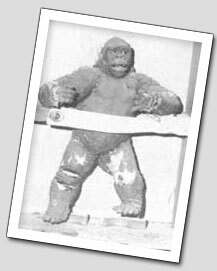 Once again, a tattered Mighty Joe Young stands in for Kong. Perhaps it's even the same puppet Desi Arnaz brandished for a visiting "Westinghouse representative" seven years earlier [See 'Wrong Kong - Part 1']. To Cooper's credit, he plays along and doesn't ruin the evening by pointing out his host's well intentioned error (he was, after all, the inveterate showman upon which Carl Denham was patterned). Yet another in a series of instances where Mighty Joe is misidentified as Kong — as if they're the Smthers Brothers or something — and, alas, not the last time; there'll be more cameos by Mighty Joe in future installments of the Kong Files. In the meantime, fair warning to KING KONG '33 purists out there; next week's topic involves...gasp...the 1976 remake (another example of "the Wrong Kong"? ).